working with crayons, paints, and puzzles. Her love of crafts began with doing craft projects with her mother and watching her family do the hands-on work, turning each of their homes into beautiful living spaces. Later, she began working with ceramics and learned much from some brilliant teachers at a progressive high school. She was encouraged by her parents and continued to explore while working a “regular” day job. She met her husband, Howard, at one of her jobs and they continued their artistic pursuits together… he becoming her cheerleader. Marie began creating with polymer and she and Howard coined it the “new age” modeling medium. They started selling their products, doing shows, swap meets, and home shows and teaching others how to use it. She had a thriving gift business with employees and her work was in showrooms on 5th avenue in New York and Los Angeles, selling to Nordstrom’s, Macy’s, Bullock’s and the Icing, just to name a few. 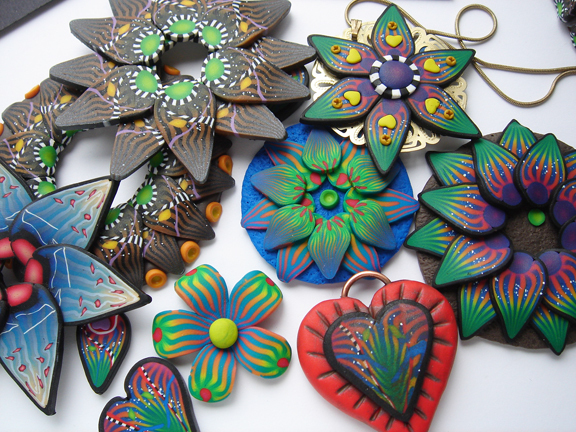 She believes this helped move polymer clay in to the mainstream view. 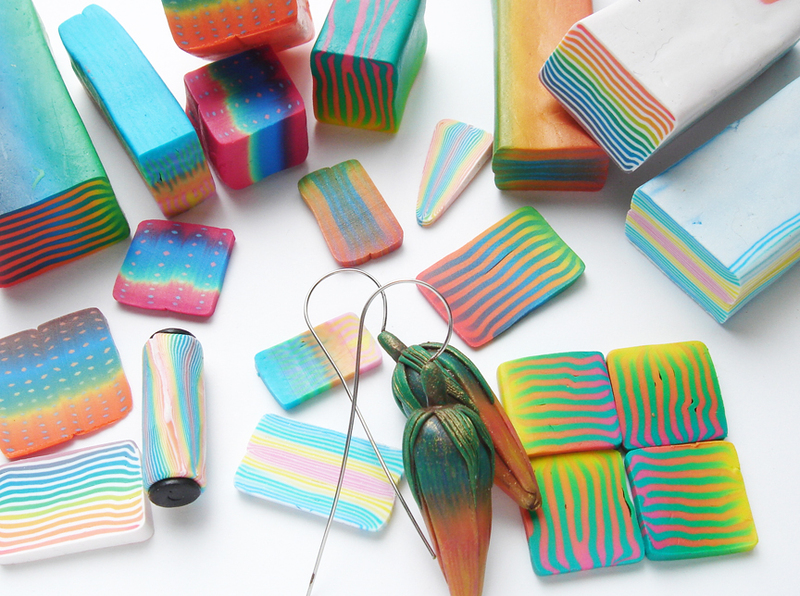 Marie works primarily with Cernit polymer clay and loves its color palette, consistency, finish, hardness, and the extreme durability after baking. The porcelain effect of the clay reminds her she has come full circle from working with ceramics. This change has expanded her creative abilities beyond her expectations and opened new areas that she believes might not have happened without the change. For those sculptors or beginning clayers who want to learn about caning, this class is for you. Marie will teach you about creating beautifully shaded canes using the skinner blend. You will learn about many ways to use and play with them in your designs including numerous ways of laying out your design.Specific canes to be made are the spotted shaded cane and translucent shaded cane. NOTE: This workshop will be taught only once during CFCF 2013. Marie will present this 4-hour class on cutting, re-assembling, and distorting a shaded cane that will give you the image of painted slabs or slices. These slices can be used for petals, coverables, and for applying and enhancing other pieces of your work. They can even be combined into other canes. They have a somewhat fabric like feel to them and at certain stages in the construction can be made in to sheets of faux fabric. We will build the primary cane, add, cut, hack, and insert components and you will walk away with at least one star brooche. She will also show you how to design and develop other canes, apply canes to forms, and build other unique designs and petals. NOTE: This workshop will be taught only once during CFCF 2013. Lori, yes, Marie and all of the instructors do some really incredible work. We are so proud to have them here. Are you ready?